Or should we expressed it differently, Hulu welcomes AWS but Dropbox moves away? I guess is still semantics, the information is the same. But the positive or negative connotation will depend on what service do you consider more relevant: Hulu or Dropbox. The fact still remains that Dropbox recently decided to opt for building their own cloud and Hulu is now one more streaming media company using Amazon Web Services (AWS). Dropbox represents probably the most known cloud storage options for end-users since it was one of the first platforms (started in 2007) that were offering in a freemium mode (giving the users a free option but an option to expand storage with additional fees) file hosting services in a very simple and user-friendly management. OneDrive (initially known as SkyDrive) from Microsoft and Google Drive started offering the options later and in some cases not as easy to manage. Over the course of the years, Dropbox represented one of the most appealing tech companies, winning several awards and even with a valuation of $10 billion. They made several acquisitions, including Mailbox (email app) and Carousel (photo and video gallery app), both of those initiatives were shut down in 2015. With the current Dropbox numbers of 500 million users and 200 thousand of business customers, Dropbox has decided to take a leap of faith: Moving away from AWS (no formal complaint about Amazon’s service) to build their own network. They are building three datacenters across the United States to host their infrastructure and of course setting a network backbone between those datacenters that can guarantee low latency. It is for sure a business decision to gain trust with their customers and manage their own infrastructure, and the overall service reliability as truly their own. Dan Williams, head of product engineer recently said: “I think it could be argued in fact that anyone who has built a decent-sized network like this has had some effect on the business in a positive way that is actually building trust for the user and getting more users to adopt the product or service based on the quality of the service”. Even though the confirmation was made a couple of weeks back, it still represents a major win for Amazon regarding the streaming media market (which as we all know it’s growing fast): Hulu is now relying on AWS to stream their content; same as its main competitor, Netflix. 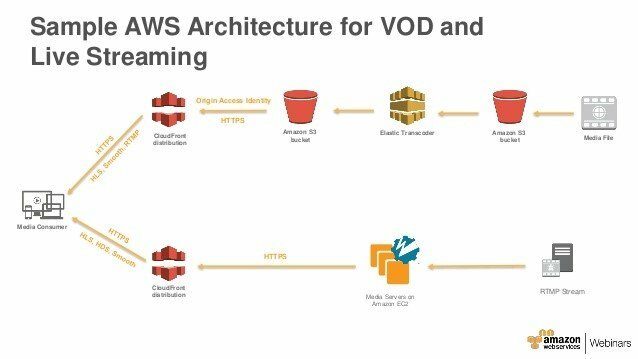 Hulu decided to make this change as part of the strategic definition around the new live TV service they are offering, AWS, in addition, will manage their normal streaming options for video on demand (VOD), re-packaging and DVR services. The biggest drivers to start using AWS are simple: Getting out the datacenter business as much as possible and speed up the time to market for new services. If you were wondering what other streaming services are running beside Hulu and Amazon Prime Video of course, here’s a list: Netflix, Spotify, AOL, BBC, Channel 4, C-SPAN, Daily Voice, Discovery Communications, Flipboard, GoPro, Guardian News & Media, Hearst Corporation, LIONSGATE, NDTV, News International, News UK, Newsweek, PBS, Simfy Africa, Sony DADC, SoundCloud, Time Inc. y United Daily News.